The words ‘adventure’ and ‘sports’ are synonymous with the Sunshine Coast. The weather is stunning year round, lending the region to any fun-filled outdoor activity or pursuit. Take part in every water sport imaginable and some you may have never even heard of. On the Sunshine Coast you can go snorkelling, surfing, swimming, scuba diving, kayaking, wake-boarding, canoeing, boating, kite boarding, kite surfing, jet skiing, jet-packing and jet boarding. 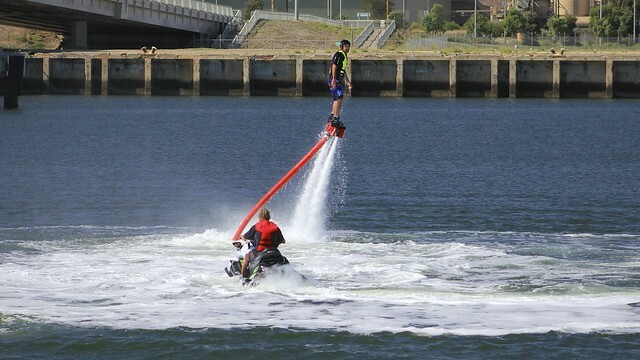 Jet-packing and Jet-Boarding are as adrenaline feuled and exhilarating as they sound, strap into a jetpack attached to a boat or jetski that acts as a powerful hose, projecting a jet stream of water downwards and creating a huge amount of force. Ever turned the garden hose on full bore and then held the hose a metre away from the tip? Don’t worry though it’s much more controlled than that - in fact it’s quite stable. With a little practice you can start doing backflips and more. It’s the closest you’ll get to wearing an iron-man suit or flying around on a futuristic hoverboard. And you can do it right now on the Sunshine Coast! There’s great places for watersports and activities all over the coast but the calm waters of Maroochydore are particularly good. There’s more than just awesome water sports too. There’s plenty of fantastic bike and hiking trails that wind through natural forest and give you coastal ocean views along the way. Go horse riding or ice-skating, rollerblading or even play a round of golf.